Click here for Mechagodzilla and Rodan! A freaky big, and spiky crystal, meteor hits a pacific island and grows some spires there. Completely forgetting the moral they learned last time out, G-force is building another piloted giant robot. This one is called M.O.G.U.E.R.A. (Mobile Operation Godzilla Universal Expert Robot Aero-Type), has a lot of spirally pointy bits, and separates into two, equal sized, independent, transforming vehicles to make it even more Power Rangery/Voltrony than Mechagodzilla and Garuda were. Whenever I buy a new action figure, which has become much less often due to the need to put my money towards frivolous things like food and shelter, I get over excited about getting to that new figure vinyl smell. This leads me to forget to document the packaging, and destroy any chance of creating a proper and “official” review. Either that or I wait so long for it to be on sale, that anything I’d have to say would be redundant and well after the fact. A) A good performance review. In 1992 the world wises up and founds the United Nations Godzilla Countermeasures Center. Miki is a member, obviously. Side note: I realize I tend to mostly name only the Kaiju, and use descriptions for the human characters. This comes from where I place everyone’s importance to the story. A key exception is Miki Saegusa. This is for two reasons. 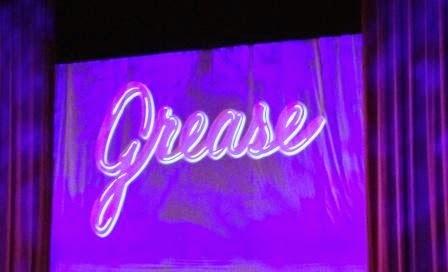 My sister and I took our kids to see Grease at the Paper Mill Playhouse this past weekend. I like to bring these things up, not from any belief that I have the knowledge or ability to comment competently on this art form, but to point out that we’re not raising our child solely on a diet of stupid movies. Therefore bear with me if this post veers between the confusingly pointless and the blisteringly obvious. Warning: I'm going to pick on the 1978 movie. This is likely due to my folks seeing it when it first ran on Broadway (because they were that cool), and my Mom playing the original cast album frequently during my childhood as part of my in-depth cultural education. In the interest of full disclosure, the reason we went was Bobby Conte Thornton, playing Danny Zuko, is my Mom’s cousin’s grandson. That means he’s her cousin and mine too, right? It’s one of those of Nth cousin Xce removed things that I can never remember how it works. Miss the crazy time travel one? Click here. A year after the last sighting, a big meteor hits the Pacific Ocean. It is in fact, FREAKY BIG and wakes up Godzilla, raises ocean levels, causes typhoons, and uncovers an excessively large egg with a familiar theme song. One of the reasons we were slow to start watching Godzilla films together was my daughter’s sudden interest in watching the James Bond franchise. This started after she caught bits on the near constant marathons as the rights jumped from network to network. There was no way I was going to discourage any leanings towards viewing the gold standard of Fun Action Adventure Franchises. Instead of doing full blown “Through a Kid’s Eyes” analysis on each one, I’m only going to hit the highlights. 1) There’s a fair amount of repetition, due to the strong ties with popular culture and styles of the films’ times. The Sixties can be difficult to explain, I’m expecting the Seventies and other decades to be similar. 2) I need short posts sometimes to fill in and allow me to finish longer rants. There are enough of these to fill that role quite nicely for a while. 3) Over analysis goes against the grain of these adrenaline juiced adventures. Doing it this way makes it easier to kick back and enjoy the spectacle. Miss the new beginning? Click Here. Hey, Ifukube’s back again. This is fantastic. While the Eighties Hair Metal Guitar versions of themes in the last film were interesting, they don’t fit the new dark, brooding, and mystical Godzilla very well. Taking a moment here to congratulate my daughter, because she earned it. An H-bomb test on Bikini Atoll mutates a dinosaur into the 50 meter tall living nuclear reactor Godzilla, who gets his name from some natives on Odo Island, also known for dancing in masks that look like caricatures of Richard Nixon. He scares the boojeebers out of natives and visitors on Odo and creates many urban renewal jobs in Tokyo. Doctor Serizawa creates a new horrible weapon, the oxygen destroyer. He only tells Emiko, his betrothed who loves another, about it. She decides that his alka seltzer of doom is preferable to a giant radioactive behemoth destroying the entire country and rats him out to her new squeeze Ogata and her Dad, Doctor Yamane. The eye patch sporting Doc sets it off in the water (with an assist by Ogata as Doctor Yamane and Emiko watch) where it makes a lot of bubbles and disintegrates Godzilla, Doctor Serizawa, and its own secret (tragedy tragedy tragedy). The film is released in the US two years later with added scenes of reporter Steve Martin (played by Raymond Burr) commenting dramatically. These are not the monsters you're looking for (Jedi finger wave).